A writer, her boyfriend, their 2 kids and a dog afloat on their sailboat Falkor. 2 months apart, 1 Atlantic crossing without kids and the entire crew is back on Falkor in St. Lucia! 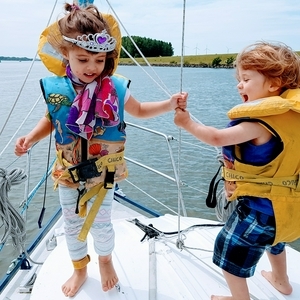 An update on sailing with kids and 6 months of living on a sail boat! An update on internet and sailing at night with kids. Patrick updates us on the next leg of our journey which should take us out of the bay of Biscay. When at anchor you don't want to go bump in the night.